The City of Lynchburg began draining College Lake the morning of Saturday, August 4, to relieve worries about flooding and the stability of the dam. The water level has fallen significantly, exposing the lake bed in much of the area. College Lake drains into Blackwater Creek Saturday afternoon, as seen from a trail near the lake. The city has asked the public to stay away from the stream area near the dam and also not walk on the lake bed, as well as stay out of blockaded areas where the road is closed. This includes the section of Lakeside Drive in front of the main entrance to our campus. The University of Lynchburg ask that students, faculty, and staff respect the city’s request for their personal safety. Click here for more information. The city also announced part of Lakeside Drive will remain closed for six to eight weeks while the roadway is repaired. The main entrance to campus is accessible for University traffic, though. The city has established a detour that uses Old Forest Road. Click here for details from the city’s news release. At the end of the detour, turn right onto Lakeside Drive to reach the main campus entrance. 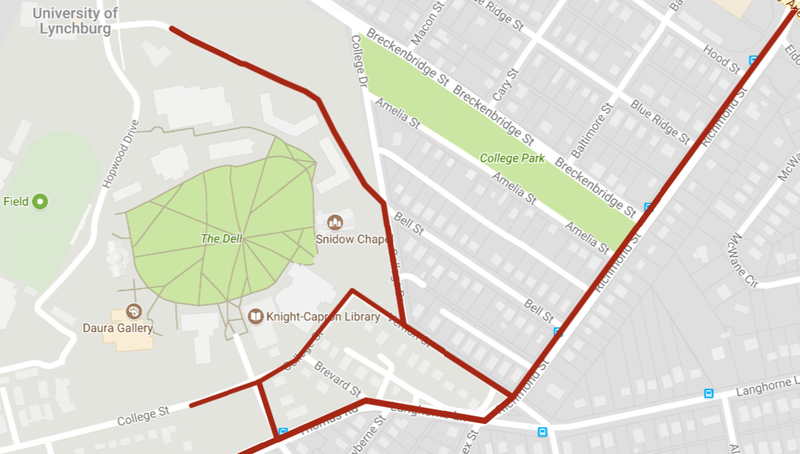 Because of the road closure, the University suggests current students, faculty, and staff use Vernon Street and College Street to access entrances to campus, if convenient. Accessing these roads from Richmond Street rather than College Drive is ideal. See the map below for an illustration of suggested routes. With the lake drained, Blackwater Creek has already begun carving a channel through the lake bed. City staff members have indicated that this week’s events make it a higher priority to reach a final decision regarding the future of the dam and the lake. The University is committed to working with the city to find a solution that serves the general public and the University.